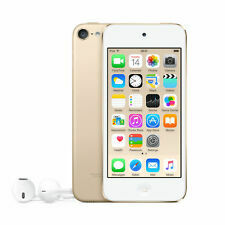 For Sale - Apple iPod touch 6th Generation Gold (32GB) MKHT2BT/A. Grab A Bargain. Unlocked From iCloud/FMI. Apple MD717BT/A) 5th Generation 32 GB iPod Touch - Blue. Condition is Used. Dispatched with Royal Mail 1st Class. IPod Touch. iPod Classic. iPod Shuffle. iPod Accessories. iPod Parts. We can best describe this grade as “used but well loved condition”. Product has been through a thorough screening process by our engineers and is graded as A standard. Apple iPod touch 4th Generation (Late 2011) Black (32GB). iPod & Third party EARPHONES AND USB. iPod Classic 3rd Generation 20gb. I have lost my charger for this, but it is in working condition. Model: iPod Touch 5th Gen. Make: Apple. Up to 40 hours of music playback. Up to 8 hours of video playback. New listingAPPLE iPod touch - 32 GB, 6th Generation, SILVER - Fully Boxed & Free Delivery! Here we have my iPod touch 6th gen 32GB Silver iPod touch in mint condition! 1 Quick start guide and 1 apples sticker. My iPod touch was kept in a yellow 3D m&m soft silicone gel case / cover which is included. MPN: A1136. Model: Apple iPod Classic Video 5th gen. Product Family: iPod. Colour: Black. We can only apologize for this, and hope this does not cause you any problems. Great service. Quickly resolved 1 small issue. 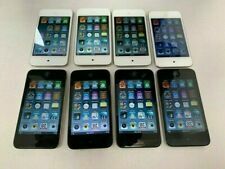 Ipod Touch 32gb 1st 2nd 3rd Generation 1 2 3 Spares No Charger Etc. Condition is used. Don’t know if it works as it’s been laying around in one of our storage boxes forever. No charger etc. Sold as seen. 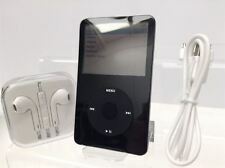 IPOD 3RD GENERATION Classic 20GB A1040 Spares. Condition is Used. Dispatched with Royal Mail 2nd Class. Ipod Classic 5th Generation 30gb. In fantastic condition a couple of light scratches on the back as seen in the pictures, no marks on the front. Has been kept in the original wallet shown in the car for years. Really is in great condition!! 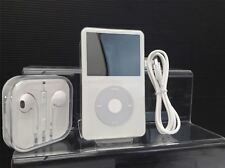 White iPod Classic (5th Generation) 30GB. USED. Has minor glitch across screen most likely just from age, otherwise in working condition. Does have minor scratches on back. Hasn’t been used in about 8 years. Dispatched with Royal Mail 1st Class. Apple Ipod touch 6th generation 32gb - product red, special edition. Condition is Used. Apple iPod touch bought for Christmas but daughter has now got an iPhone and no longer wants the iPod. It has hardly been used. IPOD TOUCH 3RD GENERATION - 32GB. USED - SIGNS OF USE. Battery life indicative of age. In full working order. Unit will be reset to factory settings prior too sending. No box or headphones, unit and charging lead only. Black Apple iPod - 30 Gig - 5th Generation. It Does Have Marks On It But Apart From That It Is Fine. Condition Is Good. Serial Number:2Z6442N1tXK. Apple iPod touch 6th Generation Pink (32GB). Condition is Used. Collection in person only. Reason for sale is due to a upgrade for more storage.